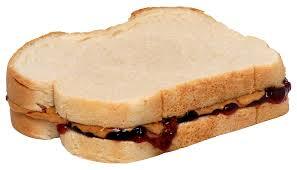 Hats and Rabbits: Teaching Fear: PB&J and "Racism"
And, of course, it's on white bread. I remember once telling a friend that someone we both knew well was "kind of a racist." Knowing that person to have been a good, friendly and sympathetic person, my friend said: "I can't believe he's racist -- prejudiced, maybe, but racist is too strong of a word..."
The friend who made that distinction was and still is strongly vocal against racism. He hates it deeply and has, occasionally, displayed this is pretty confrontational (and even violent) ways. But, still, he saw a distinction between racism and prejudice. Racism, he pointed out later in the conversation, is about hate and notions of racial superiority; prejudice is pre-judgement, based on stereotype. This conversation happened decades ago. Since then, it seems the lines have been blurred or even erased. This is what the tone of society's ideas about race has done. I could go on about a number of things, including the continuing loss of cultural identities as a result; or, I could again write about the story of a black student of mine at Rutgers who wanted to be referred to as "black" and not African American, because his people had not come from Africa... But I won't. She's right on one level and wrong on another. She's right in that this is a teachable moment. It gives a good teacher an opportunity to expand the cultural knowledge all of his or her students by asking good questions. But to imply that it is "racist" to mention peanut butter and jelly because some kids don't eat it is just asinine. And to carry that kind of an attitude is to breed linguistic fear -- the kind of fear that lead my older son to call my younger son a racist for mentioning the works of Dr. King in what he had been, somehow, conditioned to believe was "the wrong way." I can't believe people don't see what a culture of fear we are creating. It's a culture of oppressive pseudo-sensitivity. Maybe it's a New Jersey thing, but you're the only other person I've ever seen who recalls (as I do, from the '70s and '80s) the distinction between "prejudiced" and "racist." When I was growing up, my black friends made the distinction all the time: the Klan was racist, Bull Connor was racist, but the teacher who seemed less nice to black kids than to white kids, or the old guy whose house we avoided on Halloween? Prejudiced. What I like about the distinction, in retrospect, is that "prejudiced" acknowledged the bad person's humanity, whereas "racist" meant they were pretty much irredeemable. As for the PB&J story (which looks like it's a couple years old), I find the reactions of the principal wholly racist. Native-born mostly-white American kids can learn about Somali and Mexican culture and food and widen their horizons, but children of recent immigrants should be pandered to with topics and terminology they already know? When a principal enforces a system that ensures the privileged or native-born kids learn more than others, I'm not sufficiently generous to call that "prejudiced." Jeff -- Thanks for mentioning the date of the article. Someone posted it today, and I did not notice -- I revised a mention of that into this. What an interesting take on the racism of the principal. I hadn't worked it out to that level, myself, but you are absolutely right.